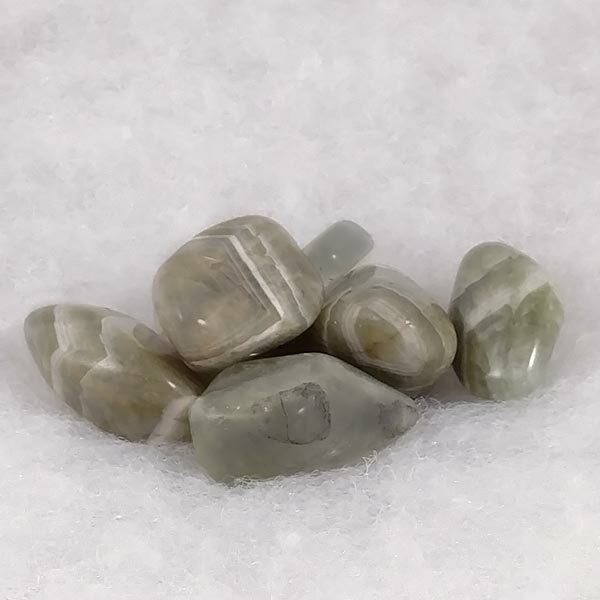 Prasiolite healing tumbled stones. Also correctly called Green Amethyst. These are nicely polished and have a pale light green tint in their coloring and a very bright energy. Size is 1 inch with some being larger. Most are an elongated shape. Prasiolite provided a nice calmness making deep meditation occur more quickly. Overall, I have to say this seems to be one of those stones that provides a nice 'ahhhhh' effect. Repairs this chakra after a heart scar opening. Heals abandonment, loneliness and emotional upset. Soothes and refills the heart after emotional releases. Aids the heart and emotional body healing by easing fear and panic attacks. Prasiolite has a Trigonal crystal system and is in the mineral class of oxides, the quartz group. It's pale green coloring comes from the traces of iron that are lodged between the layers of its structure like its sister Amethyst. While Amethyst receives its color from the presence of Fe+3 (three iron molecules) the green occurs when only Fe+2 (two iron molecules) is present. It is a gem that is traded with variety of names and sometimes, in deeper green colors, mistaken with expensive gems like Green Beryl, Peridot and Tourmaline. While the deeper green colors have most likely received man-made heat treatments, the paler varieties (as in citrine) have been slightly cooked naturally by our mother earth. Since 1950, almost all natural Prasiolite had come from a small Brazilian mine, and, more recently, it has been found in Lower Silesia in Poland, in the Thunder Bay area of Canada, and in some areas of Arizona here in the US. I have found these to carry a very bright energy when held as well as appearing bright to the eye. When held, its relational connection to Amethyst, and a solid earth connection, can be felt almost immediately. I found in working with these over several weeks that its other aspects revealed themselves much more slowly, building as they increased their connection with me. Prasiolite would seem to need to be used over very long periods of time since it takes a bit to attune to personal energies. Direct skin contact seemed to speed its effects rather than just keeping in a pouch or pocket and carrying. Rather nice effects were provided during meditation. 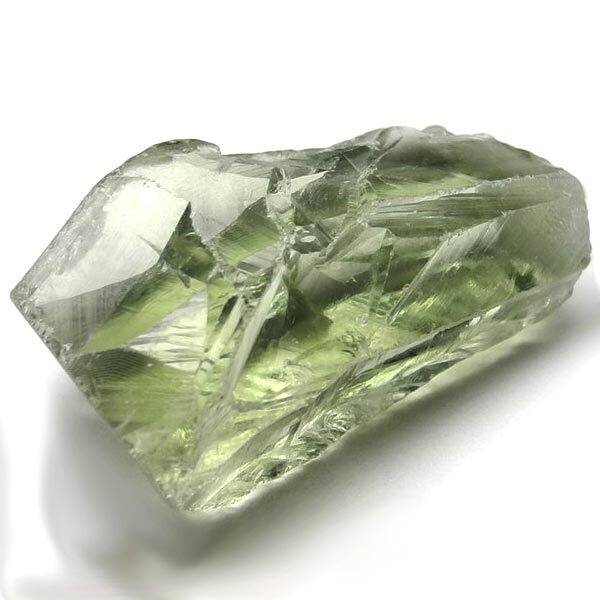 Prasiolite provided calmness making deep meditation occur more quickly. Overall, I have to say this seems to be one of those stones that provides a nice 'ahhhhh' effect. In bringing in calmness, it brings to light that many earthly concerns bear no weight as far as spiritual matters are concerned. Not to say you wouldn't care anymore, but more of asking the question, 'how important is it?' in matters where unreasonable fears may try to take over in our life. Prasiolite seems to calm emotions in general, preventing wild swings. It would seem to short circuit anger from erupting into an outburst, and instead offers a calm look at a situation to see different avenues to resolve those types of situations. Prasiolite inspires and stimulates creativity. It would seem to provide this by its calming effect which then allows us to explore with our imagination all the infinite possibilities. Prasiolite assists in balancing the endocrine system. It also seems to have a pain relieving and cooling effect in the case of joint swelling, and seemed to work fairly rapidly for that purpose. Prasiolit has affinities with all signs. It has a Receptive Energy, it's Element is Earth, and its Planet is the Moon. Prasiolites name has been derived from the Greek words Prason and Lithos, which mean 'leek,' due to color similarities with vegetables. It is currently being used by those who do manifestation work specifically to increase money or to provide an easier life. There are some accounts of it being used for healing the eyes, bruises or contusions. These accounts are vague, and could also be attributed to Prase that has some of the same coloring but is much more opaque.